A much branched upright and very showy shrub from the Cape Floral Kingdom. 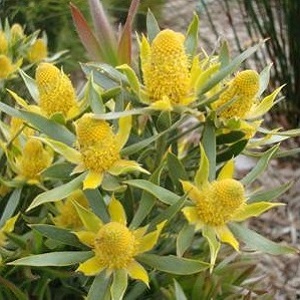 The Flats Conebush is part of the Protea family, and it grows silvery silky-haired leaves with profusely branched flowerheads of bright yellow brachts in early summer. The silvery leaves shimmer in the wind. The stems and brachts make long lasting and popular cut flowers. The Flats Conebush grows best in full sun and watered, well-drained soil. It will sit with its roots in water for part of the year. Plants grow to a height of about 2m, and spread out to about 1m. They are not tolerant of hard frosts, especially when young, and they can be grown successfully in containers, to be moved indoors in winter. Or they can be grown outdoors all year in warmer UK and Mediterranean gardens. Pack of 10 seeds. Sow in spring to autumn. Flowering generally starts in the third year. Sowing instructions and a colour photo are printed on the packet. The Flats Conebush is now rare in the wild and these seeds come from cultivated plants growing in a Botanical Garden. Sow Sow in spring or autumn. Sow in a tray or small pots of seed compost, cover the seeds lightly with compost. Keep at room temperature, do not let the seed tray dry out, and germination starts from 2 to 3 weeks onwards. Let temperatures drop at night. Move the seedlings to pots when they are big enough to handle. Plant out or into containers after about a year from sowing. Flowering starts from the third season. Grow Keep plants well watered and protect them from hard frosts, especially when the plants are young. Plants grow well in large pots in a well ventilated conservatory. Feed occasionally with a phosphate-free fertilizer and top dress with compost once a year. Trim back untidy stems after flowering, otherwise minimal pruning is needed. Semi-hardwood cuttings can be taken in summer to early autumn.